I glossed over the White Spotting gene in my previous overviews — partly because it needs a little graphic support. This is because unlike most other cat color genes, the visual effect of white spotting are very dependent on secondary ‘regulator’ genes. These act like a ‘volume control’ to the degree of spotting. Leaving the levels aside, the White Spotting gene is pretty simple. The dominant S gene introduces spotting. The recessive s is no spotting. The s/s combination produces no white spotting factor. Most think that S/S produces a ‘bonus’ to the spotting level, so that an S/S with level 2 might be a level 3 or 4. However, it doesn’t seem to be the case that S/S assures you of a ‘mostly white’ cat. The Birman cat, for example, has a requirement for white ‘gloves’ – just the tips of the feet are white. If the genetics required as S/s to achieve this, then half of all Birman kittens would be gloveless or would have too much white. Some writers postulate a ‘Birman Glove Gene’ that magically sets socks. Others deny this, and say mixing a new set of genes into Birmans disturbs the gloves until bred back true. This sounds more like the Birman breeders have bred a uniform ‘volume level’ that makes an S/S reliably produce the gloves they like to see. The problem with such a ‘glove gene’ is that I can’t see how a cell can possibly tell its ‘on a foot’ to implement such a scheme. At the time most of this action is happening, the embryo is a glob of cells, not an itty bitty kitten that you can paint with a tiny brush. My cats Calpurnia and Gus are both Tuxedo White Spotted cats – around level 4. Julius is essentially an unspotted cat. There are some white spots that are not part of the White Spotting factor. These are small spots on the chest, throat or belly on an otherwise non-white cat. While a few think this is a function of low levels of spotting, most think these ‘buttons’ and ‘lockets’ are controlled by other genes entirely. I agree, as those small spots are so common that most cats would have to have white spotting. Julius has a ‘button’ — although it could better be called ‘boxer shorts’ — a small white area on the lower stomach between the rear legs. His other ‘white’ areas – the whitish rings around the eyes (‘eyeliner’) and the whitish chin are actually part of the tabby pattern. In fact, the color of his chin is really a very very pale brown. The difference is easily apparent if you have him turned over in a good light – the button is pure white, much brighter than the chin and eyes. If Calpurnia and Gus have a locket, it’s covered up by their white spotting. The level regulating genes act like a volume control of whiteness. The white starts low on the cat – the tips of the feet and stomach, and then moving up the legs and merging along the stomach. The white then moves up the chest, to the throat and a blaze on the face. Now we are at the Tuxedo Level. As the white spreads, the white meets over the neck first, then up the head, back, and towards the tail. Eventually the cat can be virtually entirely white. It is also possible for a cat with white spotting to show no white at all. It can be very hard to tell the difference between a “Dominant White” cat and a “100 percent Spotted” white cat. Usually there is one or two colored hairs on a spotted cat, that the Dominant White will not have. How Does White Spotting Happen? The mechanism of how the spotting works seems to be that early in the development of the embryo the ‘color control’ develops along the nerve line, what will be the spine and back. This then migrates down the sides toward the belly and where the legs and feet will form. The theory I’ve seen is that the white spotting gene makes this drift slower than normal. So if the color has not reached a part of the embryo, then it has no alternative but to be white. Actually, I think they have it backwards, because of another side effect of white spotting – that ‘calico’ cats, that have white spotting and both orange and black, have fewer and more uniform spots, that seem cleanly separated. Tortoiseshell cats, with no white spotting have the two colors intermixed much more finely and in a more irregular way. Is there a simple way to explain this? Remember, the pattern on these calico/tortie cats comes from X-inactivation. At some point in development, each cell ‘decides’ which X to use randomly. From then on this decision is carried down through all cell divisions after that, forming a group of cells with the same genetic pattern. In a tortie cat, one X produces orange color, the other black. So all descendants of the original decider would share the same color, forming a spot. So if this happens when the embryo has a few thousand skin cells, there will be about this many ‘blobs’ on the adult cat’s fur when it grows up. Now lets assume that the White Spotting factor speeds up the time that this decision, and also the point when the ‘color control’ migrating down is needed. With less time to finish the migration, the color would be absent all the same, but not because of slower drift. 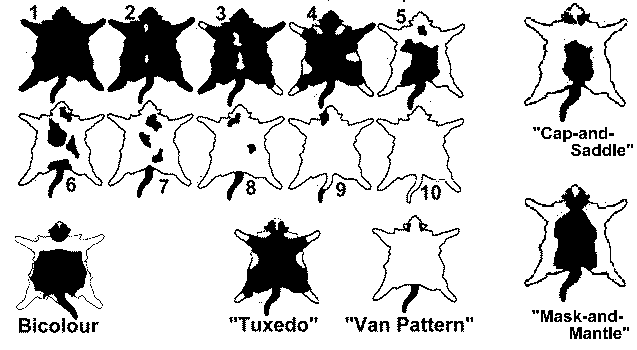 The other effect of an earlier decision is that there are fewer cells available to form orange and black blobs in the fur, so the spots that would be fewer and more distinct. I got this idea partly from a Stephen Jay Gould article on embryology of zebras, where a simple set of controls – form the stripes at this time, or later, coupled with the growth of the embryo fit both the number of stripes on the zebra, but how they were distributed on the adult animal. If you assumed a fixed size stripe pattern laid on top of the embryo at different points in development, everything else followed naturally to explain the stripes on different zebra species.. Note: I’ve put this and some additional genetic information in a separate page for easy reference. I hope you find it useful. 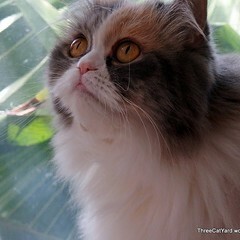 This entry was posted in Cats, Genetics and tagged Cats. Bookmark the permalink. Radcliff must have been a 99.99% white spotted kittie, then. He had a handful of dark hairs above his eyes, and a few about 2/3 of the way up his tail, but he was pure white other than that. None of the areas were dark enough to count as spots — it looks more like someone had gone over those areas with a pepper shaker. It sounds like you’re right – the places I read said that there’s often a few hairs on the “one big white spot” cat. If the black mark on the nose was black and not grey. you can probably say he wasn’t dilute either (D/-) or orange (o/Y). So you can get S/S w/w B/- o/Y and D/- from those few little spots. If any of them were agouti pattern, you could get one more (A/-). That’s a lot from just those few hairs, right? Very interesting! My Gracie would have to be a bi-color cat. If I found her picture correctly on your blog, she sure is. A pretty girl – I had a cat that looked just like her years ago.